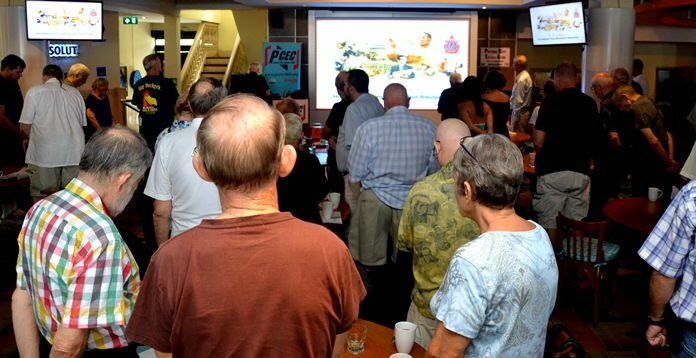 “Amazing Pattaya” was the subject of Ian Frame’s photographic presentation on Sunday 16th October at Pattaya City Expat’s Club (PCEC). On two previous occasions at the club Ian has shown photographs of Pattaya Wildlife. Ian commented that there is currently less wildlife to be found around Pattaya than there was a few years ago. He has now turned his attention more towards street scenes and sunsets. Prior to the start of the 16 October meeting, PCEC members and guests stood for a period of silence in honor and memory of His Majesty the King. Ian felt that most foreigners were surprised when they first arrived in Pattaya and discovered that their new surroundings were often very different from those in their own country, e.g. brightly painted tour buses sporting a very large number of headlights, and with their sides decorated with large cartoon characters. He also pointed out that some Thais pamper their pet dogs – often dressing them up like children or cartoon characters, and then showing them off at the beach. Member Ian Frame, an avid photographer, introduces his photographic essay, Amazing Pattaya, to his PCEC audience. He showed photos from some sporting competitions which had taken place at Jomtien and Pattaya Beaches over the past few years. In particular, he highlighted the agility of the sportsmen and sportswomen who participate in Sepak Takraw (a ball game which is played in S.E. Asia). Several colorful photos of parasailing activities were shown. He noted that many courageous women also attempted this. Other water sports such as wind surfing, dragon boat racing, and jet-ski racing were also captured. Ian also showed numerous photographs of sunsets – mostly taken during his evening walks along Jomtien Beach. He liked the silhouette effects as people gathered to watch the sunsets. A few sunrises were also shown. When one speaks of car horns one thinks of the audible alarms which are used to warn other road users and pedestrians. However, a few of the extra horns fitted to Pattaya’s cars, trucks, and bikes were taken from buffalos. Some examples were shown – including a push bike sporting a buffalo skull. 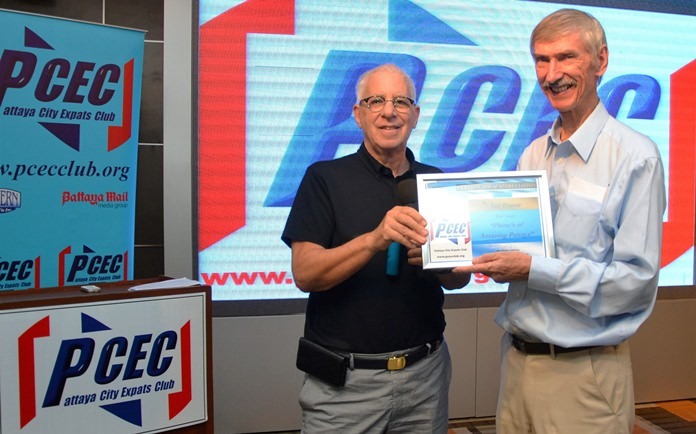 MC Richard Silverberg presents the PCEC’s Certificate of Appreciation to member Ian Frame for his presentation of photographs showing that Pattaya’s streets and beaches can reveal some truly amazing sights. Some of the large motorcycles seen around town have had much attention lavished upon them. They are mostly immaculately maintained, and some even sport interesting additions e.g. fan, compass, phone, and Hi-Fi systems. Ian’s attention was also drawn to the dummy clothes models positioned outside a few of Pattaya’s shops and restaurants. Of course we all know Ronald McDonald, but many of the other “smiley-faced” models attracting attention around Pattaya may be peculiar to Thailand. Over 60 members and guests took advantage at the 16 October PCEC meeting to receive this year’s flu vaccination at a discounted price. 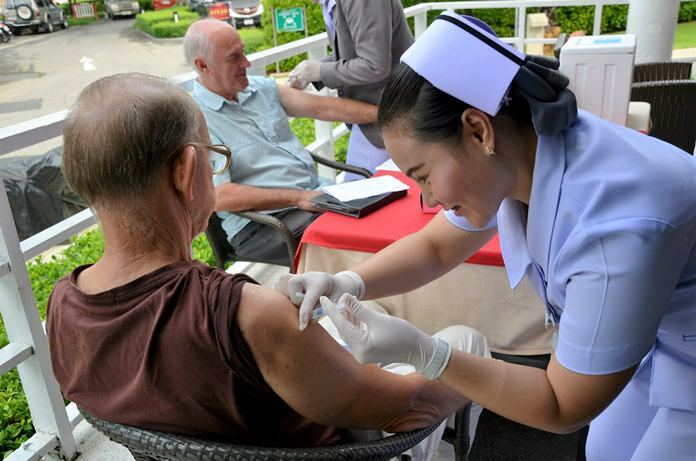 Some very nice nurses from Phyathai Hospital Sriracha were available to administer the flu shots. The vendors selling armfuls of colorful inflatable toys on the beach also make interesting photo subjects. They stroll up and down between beach goers in an attempt to peddle their wares. He suggested that interesting and unusual photo effects could be obtained by photographing subjects via reflections in shop windows. The objects in the windows merge together with the street scene in the final photograph. Member Roger Fox interviews Ian Frame about his presentation to the PCEC. 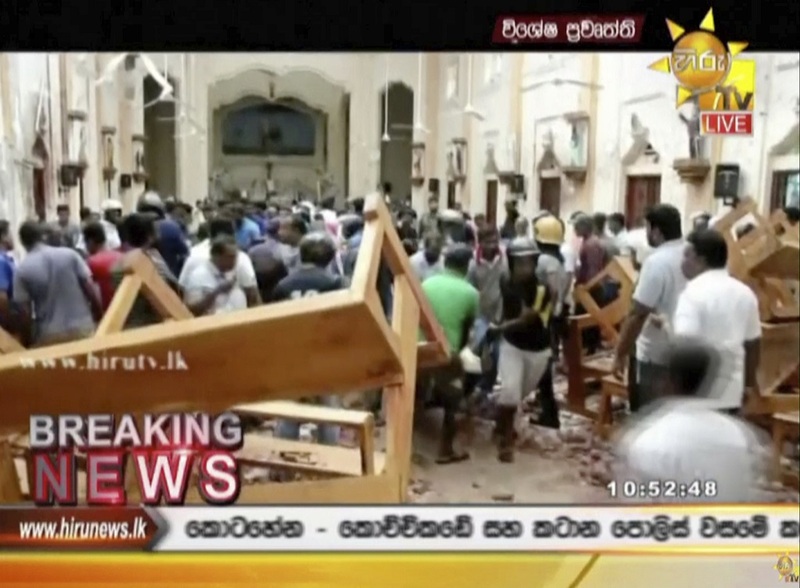 To view the video, visit https://www.youtube.com/watch?v=-2w-AhmTo-o. Ian concluded his show by showing a number of photographs which were taken at Buddha Hill. This location provides lots of subject material for a photographer. 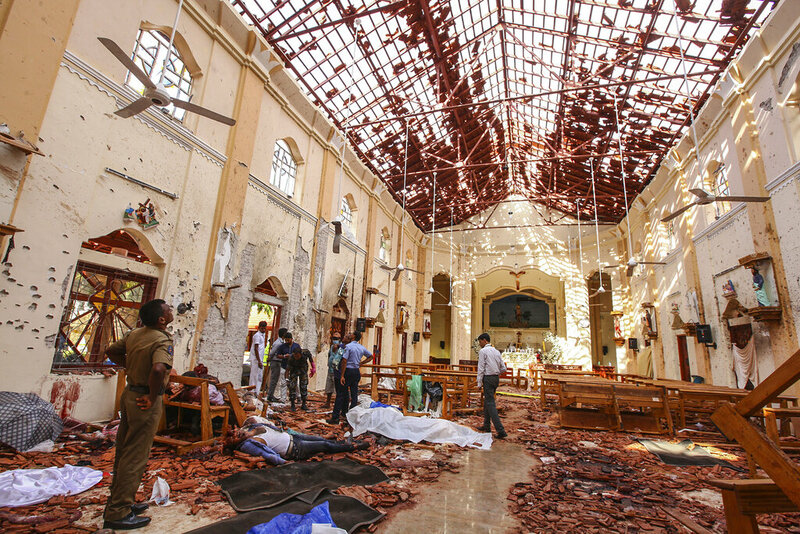 There are usually also tourists releasing birds and ringing bells. If one goes to Buddha Hill in the late afternoon it is also possible to witness some good sunsets. One of the many photos of Amazing sights in Pattaya shown to the PCEC by Ian Frame. 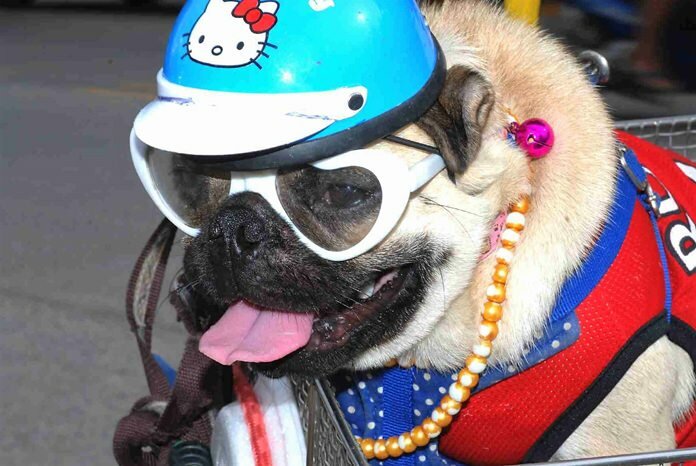 He showed several featuring dressed up dogs and mentioned that Pattaya has clothing shop for dogs. 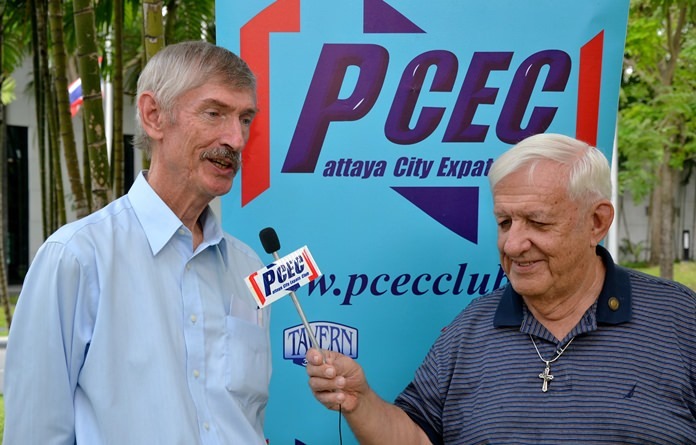 After the presentation, MC Richard Silverberg brought everyone up to date on upcoming events and was followed by the Open Forum, where questions are asked and answered about Expat living in Thailand, especially Pattaya. For more information on the PCEC’s many activities, visit their website at www.pcecclub.org.